Nidzica [ɲiˈd͡ʑit͡sa] (formerly German: Neidenburg (help·info); Polish: Nibork) is a town in the Warmian-Masurian Voivodeship of Poland, lying between Olsztyn and Mława. The capital of Nidzica County, it had a population in 2017 of 13,872. The settlement was founded in 1355 by the Teutonic Knights and received town privileges in 1381 from Winrich von Kniprode. Although a member of the Prussian Confederation, it remained with the Teutonic Order after the Second Peace of Thorn (1466). It then became part of the Duchy of Prussia after the secularization of the Order's Prussian territories in 1525. In 1656 Neidenburg was unsuccessfully besieged during the Northern Wars. The town became part of the Kingdom of Prussia in 1701. Half of Neidenburg's inhabitants died from plague from 1708-1711. It became part of the German Empire in 1871 during the unification of Germany. At the beginning of World War I in 1914, Neidenburg was heavily damaged by invading Imperial Russian troops; 167 residential and agricultural houses, 8 public and 58 business buildings were destroyed by artillery fire on 22 August 1914. The town was reconquered and rebuilt by the Germans after the Battle of Tannenberg later in August 1914. The reconstruction was originally based on plans by Bodo Ebhardt, however, his neo-gothic style was not carried out; instead, a neoclassicist style was preferred. As a result of the Treaty of Versailles, the East Prussian plebiscite was organized under the control of the League of Nations on 11 July 1920. The votes were 3,156 for remaining in Prussia and 17 for joining Poland. During the Kristallnacht riots in November 1938, the synagogue was destroyed and two Jewish inhabitants, Julius Naftali and Minna Zack, were killed by Nazi SA members, while several others were injured. The surviving members of the Jewish congregation were deported and killed in the Holocaust during World War II. Neidenburg was the seat of a district in East Prussia until 1945; in that year the Red Army entered and occupied the town while pursuing the retreating Wehrmacht. While many, if not most, German civilians had fled the area, many of those who remained experienced atrocities at the hands of Soviet soldiers, who found themselves on German soil for the first time. Lev Kopelev, a Soviet officer and later dissident, described how he was appalled by the acts of murder and looting against those who remained. In the post-war settlement, Neidenburg fell within the area of East Prussia annexed by Poland, and the remaining German population was expelled. 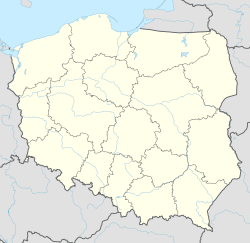 Rather than being renamed to the traditional Polish name Nibork, the town received a new name, Nidzica. Wikimedia Commons has media related to Nidzica. ^ "Nidzica (warmińsko-mazurskie)". Polska w liczbach (in Polish). Retrieved 2018-08-07. ^ Salm, Jan (2012). Ostpreußische Städte im Ersten Weltkrieg – Wiederaufbau und Neuerfindung (in German). Oldenbourg Wissenschaftsverlag. pp. 151 ff. ISBN 978-3-486-71209-4. ^ Marzian, Herbert; Kenez, Csaba (1970). Selbstbestimmung für Ostdeutschland – Eine Dokumentation zum 50 Jahrestag der ost- und westpreussischen Volksabstimmung am 11. Juli 1920 (in German). p. 91. ^ Kopelev, Lev (1977). No Jail For Thought. London: Secker & Warburg. pp. 39–41. ISBN 0-436-23640-0.